Yesterday I wrote about SendMeHome, the free service that uses specially coded labels to help honest people return lost devices to their rightful owners. If you own a smartphone and you'd rather not ruin its aesthetics with a pasted-on label, there's another way to aid its recovery: BlueRetriever, a new lost-gadget service that relies on wallpaper. When someone finds your device and turns it on, that should be the first thing they see. 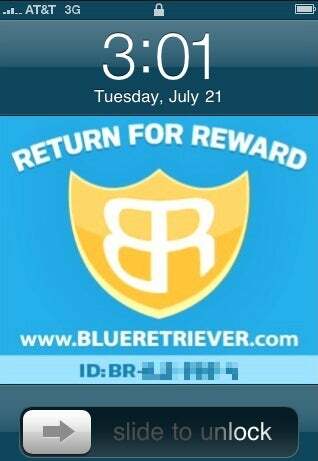 Then they head to the BlueRetriever site, enter your code, and make contact so you can arrange for your phone's return. Other than that, BlueRetriever costs absolutely nothing. I find its Web interface way easier to use than SendMeHome's, and I like the all-digital, label-free approach. However, what if your device has a dead battery? Then you're outta luck. For that reason alone, I think you're better off with a solution like SendMeHome. Of course, there's no law that says you can't use both!